Yes, there’s been a bit of a Russian theme this week after perusing many a Russian gallery site into the wee hours the other night, but this is the last of it for now, and it’s a fun one, at least I think so. 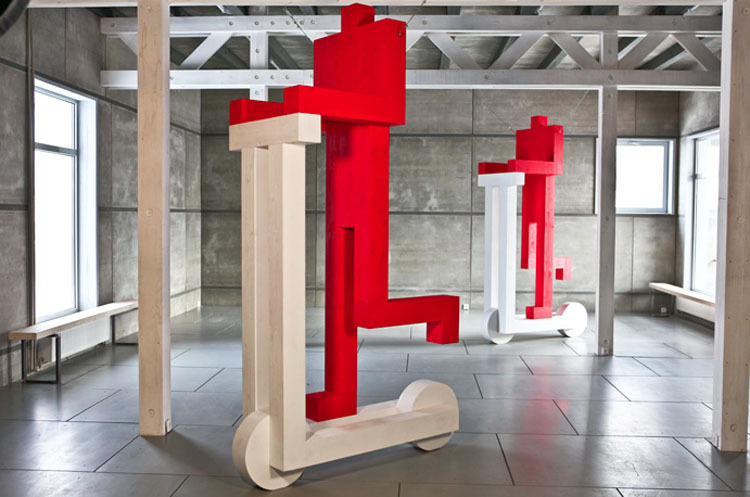 The Red People project, created by Andrey Lublinskiy and Maria Zaborovskaya of the Pprofessors art group, is a modular system used to assemble an anthropomorphous character, sometimes large, other times small, out of 13 wooden blocks. 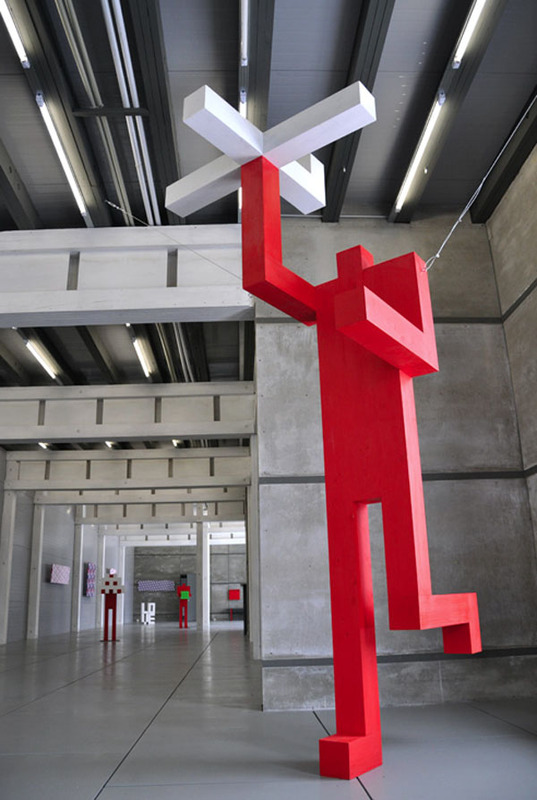 Working in practically any context and integrated therein, these Red Men have become a sort of viral phenomenon around Moscow and its environs. So much so, that they have become stars of comics and political debates, and are slowly making their way across the world. 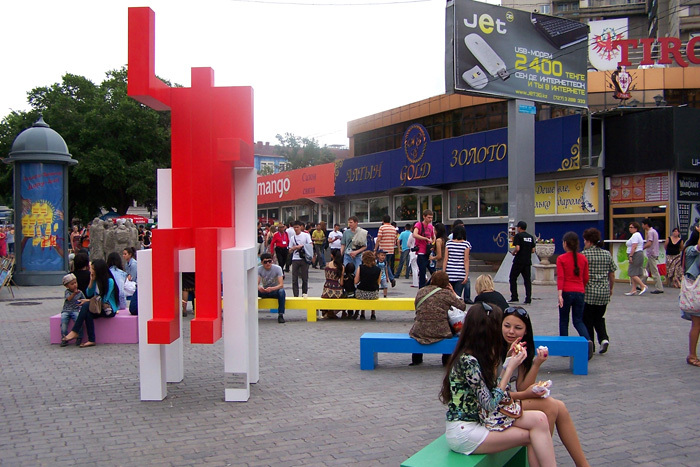 With inspiration from, and a nod to, cult artists such as Malevich, Rodchenko, Bruskin, Giacometti, Haring and Gormley, the Pprofessors have made these red contemporary icons pop up in the most unexpected of places, including sitting by a park fountain, scootering around the streets of Moscow, or sitting in the middle of a shopping center. 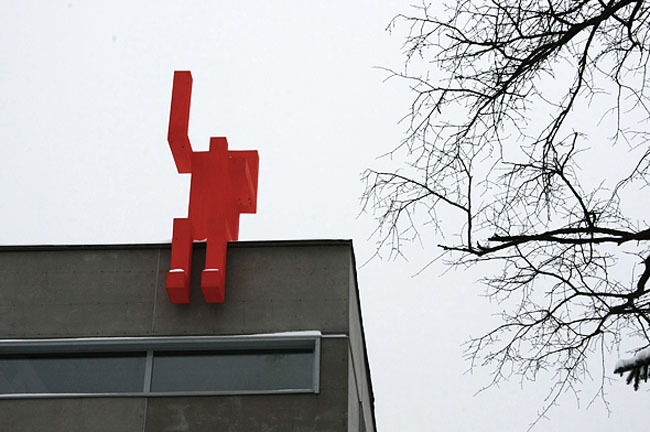 After their exhibit in 2010 at the Gridchinhall Gallery, a few of the men have become permanent fixtures on the grounds, with one sitting atop the gallery’s building entrance. The Pprofessors also created a toy-like kit of the Red People, where each child (or adult) can manipulate the elements of the composition using the basic red blocks included in the kit. All in all, a very fun project that I could see taking off in NYC. This entry was posted in Art, Fun, Industrial Design, Pop Culture, Street Art, Stuff We Like. Bookmark the permalink.